I was talking weddings with the wonderful Rhi (you might know her as the powerhouse pixie behind Hey Gorgeous Events), and confessed how nervous I am to plan in view of so many other wedding bloggers and aficionados. But as I started to talk about the morning ceremony and brunch reception we're dreaming of in shades of white and grey with touches of crimson, I was so swept away in the excitement that I forgot to be self-conscious. In a world of over-proped photos, it's easy to feel like you're living a life just a little less fantastic than everyone else you know. But if you stop worrying about what your Facebook friends will think and celebrate the things you truly love, your wedding/kitchen remodel/dinner will be all your own–and what could be better than that? 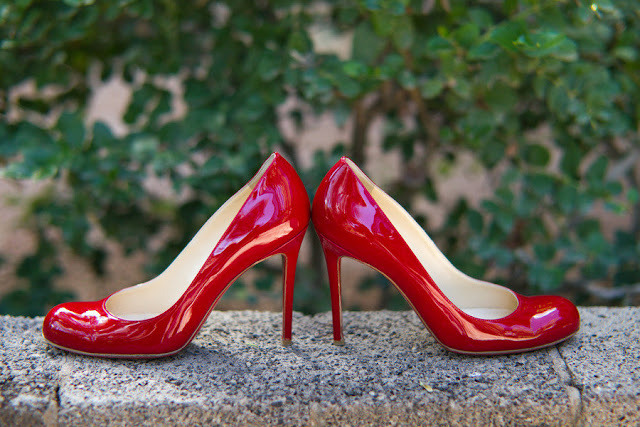 Maybe I won't actually wear patent leather red pumps on my wedding day, but it's a little peek at the celebration I just can't wait to plan! Did you feel pressure planning your big day, or face it now? How did you handle those moments of self-doubt? Image by Jennifer Bowen Photography. This is such a wonderful post! I don't have a personal Facebook account and learned to share very little about my personal life, I feel better now because I know that these moments are for me and no one else to enjoy. There's nothing more beautiful than someone who is satisfied and happy with her/his life. What other people think is the least important thing. I have a pair of shoes that look very similar to these and love them. I didnt really feel much pressure when planning my wedding...well I felt pressure but it came from myself. These remind me of ice cream cones with a cherry on top ;) I just love them!!! First of all I have those exact same shoes- I love them. Wow. This post is so timely for me. I'm in the middle of a shoe crisis planning my wedding in September. Great reminder that I am not marrying the shoes. Re-focus on what's important. Seriously? I just bought my first pair of red heels and died with excitement. Cue dramatic music. Umm... I cannot tell you how ridiculously excited I am about your wedding. GAH! Those photos will be magnificent! the way i do it is by thinking that everything that i'll regret in the future is those things i don't do instead of the ones i do... i know it sounds cliche but it works out when you feel insecure about what you're doing! I think it would be super stressful to plan given the added pressure of blog perfection, but the most important thing is to let.that.stuff.go. My husband and I will be celebrating two years next week (woohoo!) so we were pre-Pinterest and I cannot even imagine how much more pressure couples face now that there are SO many more pretty pictures all in one place. It was still very nervewracking though and I definitely felt the pressure to have everything 'perfect' according to other people's standards. Lots of late night talks with my husband assured me we were making it about us and not other people. I'm sure you and John will be the same way - there is no way your gorgeous aesthetic and beautiful personality will not shine through. We had so many guests tell us that our wedding was so 'us' and I have no doubt that yours wouldn't be the same way. What a great post - with so many things to compare to the choice can be a little paralysing, but you are right, at the end of the day, it has to be the right thing for you, and your instinct will tell you when it is. As for those shoes - wow!! I think they very much could the absolutely right thing for me :)!! You know our story. Can I confess that sometimes I feel like abandoning the entire second big celebration we're planning mostly because the planning part stresses me out so much? Beautiful shoes! I know the wedding will be fabulous. Ooh! Is Rhi helping you plan your big day??! I agree, it's too easy to get swept up in all those perfectly photoshopped wedding images. It should be about the 2 of you, what you love, and of course ensuring the guests have a smashing party! I love those thoughts! Yes, so much pressure is felt these days when planning anything! Glad to hear you are stepping back and just enjoying it! Oh Lena, I love this!! I constantly face self-doubt in planning -- but I soo agree with Rhi, you just have to keep telling yourself how beautiful it will be, no matter what! Because believe me, it will. ooh Miss Lena..I can't tell you how many times I have seen that self doubt with brides on styling and designing their wedding paper.If a bride is not an artist by profession then she now knows what feels like to be one..you are exposing you...it's scary...just yesterday I went to get a manicure...I never put color on my nails as I feel like they look weird...so i decided to try something new..I picked a color and right before she put it on I faltered..then I said to myself...be true to who you are and go with your first instinct..it will never let you down... So Miss Lena...be true and listen to your heart and it will be fabulous! Lena, you of all people should have no fear about planning the most classic, stylish, and beautiful wedding. But of course we wouldn't be human if we didn't worry at least a little bit about what others thought or how we might measure up. I hope you'll continue to share your thoughts and plans along the way. I can't wait to hear more!